Cat conjunctivitis, also known as cat pink eye, is the inflammation of the conjunctiva, a thin membrane that covers the eyes’ outer layer (known as sclera) and the inner eyelid. Redness, swelling and discharge are common symptoms. Feline conjunctivitis can occur on one eye or both eyes, and even though it’s uncomfortable and causes itching, it is not as painful as other cat eye problems. However, cat owners should be vigilant as it can become a chronic condition. In fact, many cats experience this problem on and off for months and sometimes even years. If not treated, it can cause loss of vision. A mild version of cat conjunctivitis, it causes the membrane to become pink and inflamed. The discharge is usually clear. Agents such as wind and dust are usually the culprit. However, it may be an early sign of a viral disease or a bacterial infection. This type of conjunctivitis is usually caused by a virus or bacterial infections. If the problem is contained to one eye, it is most likely caused by a virus. If it starts in one eye and later spreads to the other eye, the cause may be chlamydophila or myctoplasma. Signs include red eye and swelling. The discharge is more dense and it may contain pus. This condition usually starts as serous conjunctivitis. Allergens and other agents may cause the follicles (small mucous glands) to form an rough surface that irritates the eye. As a result, the eye generates a muddy discharge. Sometimes conjunctivitis may accompanied by other eye ailments, such as cornea erosion and lesions. Keratitis (inflammation of the cornea) and uveitis (inflammation that occurs inside the eye) are two of such problems. Unfortunately, these conditions are very painful. Redness. This is the most obvious symptom. 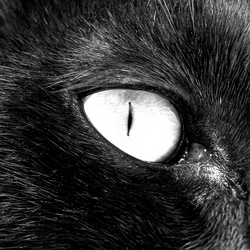 The cat’s eye(s) becomes visibly red. Swelling. The membrane covering the eye may become inflamed. Discharge. Conjunctivitis may be accompanied by a fluid that varies in color: it can go from clear to yellow to dark red. Squinting. You will notice you cat having trouble opening his eyes. Pawing at the eye. Since cat conjunctivitis may cause itching, your cat may rub her eye(s) repeatedly to stop it. Sensitivity to light. Your cat may avoid brightly lit areas. Watery eyes. You may notice an increase in the production of tears. Note: A red eye is not always a symptom of conjunctivitis. If the eye is also irritated and pain is present, you should consider other causes including keratitis, uveitis and glaucoma. Consult your vet for more information. Feline conjunctivitis is usually caused by an infection. The most common cause is the Feline Herpes Virus (FHV-1). The second most common cause is the feline chlamydophila bacteria. A mycoplasmal infection can also be an agent. Fungal infections can cause conjunctivitis in cats, but very rarely. Non-infectious agents can also cause conjunctivitis. Examples of such agents include chemical irritants, fumes, dirt in the eye, allergies, foreign objects in the eye, and injuries to the eye. For example, if your cat gets into a fight, he can get his eye scratched. This trauma may lead to a pink eye. In some cases, a vet can arrive at a diagnosis by simple looking at your cat’s symptoms. Reviewing your cat’s clinical history will also be of great help. Other times, however, additional tests may be needed, including: blood tests, cell cultures, and even DNA tests. Basically, there are three main methods of treatment: eye drops and topical creams, injections and oral medication. Treatment will vary depending on the underlying source of the conjunctivitis, however. A mild case of cat conjunctivitis may be treated with eye drops and saline solutions, for instance. If the conjunctivitis is caused by a chlamydial infection, it may be treated with antibiotics. If the cause of the disease is the Feline Herpes Virus, it cannot be completely cured. However, with proper treatment it can be controlled. Some cases of cat conjunctivitis respond well to homeopathic remedies. If you have multiple cats: Feline conjunctivitis can spread to other cats in the house very quickly, so make sure that you keep the sick cat separate from the others. Always consult a vet if you believe your cat is sick and/or has conjunctivitis. The information presented here is for educational purposes only. It is not medical advice.